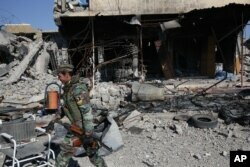 A Kurdish fighter walks past a destroyed building in the town of Sinjar on Nov. 13, 2015 after they took it from the Islamic State group in a joint operation with the coalition forces. Iraqi Kurdish President Massoud Barzani declared Friday that Kurdish fighters have seized Sinjar from the Islamic State militants who had controlled it for more than a year. "I am here to announce the liberation of Sinjar," Barzani told a news conference as Kurdish forces raised their flag in the town center. The jihadists had killed and enslaved thousands of the minority Yazidi community at Sinjar as the insurgents swept across Iraq in August 2014. Speaking at about the same time in Tunisia, U.S. Secretary of State John Kerry took a more cautious stance, saying he was "absolutely confident" that Sinjar would be freed "over the next days" by the Kurdish peshmerga forces supported by U.S. airstrikes and ground spotters. In an interview at the White House earlier, President Barack Obama said he believes the Islamic State advance in Iraq and Syria has been contained, but not destroyed. "I don't think they're gaining strength," Obama said. "From the start, our goal has been first to contain, and we have contained them. They have not gained ground in Iraq. "What we have not yet been able to do is to completely decapitate their command and control structures," Obama said during the interview (with ABC News). "We've made some progress in trying to reduce the flow of foreign fighters." 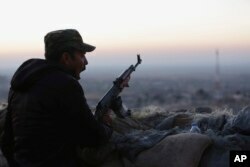 The Kurdish forces encountered little resistance in the face of Friday's advance, suggesting Islamic State fighters may have retreated or possibly are biding their time for new fighting. Peshmerga Major Ghazi Ali said, "No one was fighting back. 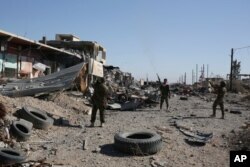 They placed some IEDs (improvised explosive devices) and had some snipers in position, but there were no clashes." Kurdish peshmerga fighters fire into the the air while celebrating the retaking of of Sinjar, northern Iraq, Nov. 13, 2015. Barzani said, "It's time for the Yazidi girls to raise their heads up. Revenge has been taken for them. Sinjar is very important because it's become a symbol of injustice against the Kurdish people." Peshmerga forces entered the city "from all directions to clear the area of remaining" Islamic State fighters, according to a Twitter post early Friday by the Kurdistan Region Security Council. The Kurdish fighters are now in control of a silo, cement factory, hospital and several public buildings in Sinjar, the group said, noting that IS is "defeated and on the run." On Thursday, the first day of the offensive, Kurdish officials said they took control of villages on either side of Sinjar and had taken over a key road on a major supply route between Islamic State-held Mosul to the east and the group's self-proclaimed capital to the west in Raqqa, Syria. The route (known as Highway 47) is used by the Islamic State group to transport weapons, fighters, illicit oil and other commodities that fund the militant group's operations, according to the U.S. Central Command. It says the U.S.-led coalition intends to increase pressure on Islamic State fighters and isolate their components from each other. U.S. Defense Department spokesman Peter Cook described the operation Thursday as a collaborative effort between U.S. advisers and Iraqi Kurdish Peshmerga forces. He said it is a specific effort to target the supply route and, if successful, will have a "significant" impact on IS operations in that part of northern Iraq. "This is strategically an important area in Iraq in terms of taking the fight to ISIL," Cook said, using another acronym for the Islamic State group. Warplanes from the U.S.-led coalition bombed the area Thursday after carrying out daily airstrikes for more than a week. Islamic State fighters seized Sinjar 15 months ago as they terrorized the Yazidi minorities living there and besieged thousands of them in the mountains. It was that offensive that drew the first of more than 5,000 U.S.-led coalition airstrikes in Iraq. A Kurdish fighter, known as a peshmerga, yawns as he stands guard on the frontline in Sinjar, Iraq, Friday, Nov. 13, 2015. Some 7,500 fighters are taking part in the effort to control Sinjar. In addition to retaking Sinjar, they want to establish a buffer zone in the area to protect civilians. U.S. and Kurdish officials estimate there were 500 to 600 Islamic State fighters in and around Sinjar at the start of the Peshmerga operation, including foreign fighters recently sent in as reinforcements. U.S. officials say 60 to 70 IS fighters have been killed in airstrikes so far. The Kurdistan Regional Security Council estimated that 100 Islamic State fighters were killed during the first day of the offensive. That the Islamic State is using just a few hundred fighters to fend off thousands of Peshmerga soldiers comes as no surprise to those who have studied the group’s tactics. "They do not expect to hold Sinjar city and will relinquish it after a tough fight,” said Michael Knights, Lafer Fellow at the Washington Institute for Near East Policy. Knights points to numerous examples over the past year in which the Islamic State group staged a preemptive withdrawal from key cities and towns, especially in Iraq. And he notes the group seems to routinely put more of an emphasis on holding rural or unpopulated areas on the outskirts. A U.S. official tells VOA the hope is Peshmerga forces, backed by U.S. and coalition air power, will be able to continue the southward push with the goal of cutting off the Islamic State group in Syria from its key holdings in Iraq. Former military officials doubt the ability of this latest push by Kurdish forces to put a dent in the Islamic State group’s operations. "I think in the short term, this will be tactically spectacular, but strategically irrelevant,” said former U.S. Navy commander Christopher Harmer, now a senior naval analyst at the Institute for the Study of War. Harmer warns the Islamic State group is simply “retrenching” after spreading its forces too thin by expanding into what had traditionally been Yazidi or Kurdish territory. "When they lose peripheral territory, like Sinjar, or Kobani, or even Hasakah, that is important but does not reduce the ability of ISIS to function as a significant destabilizing force in Syria or Iraq," Harmer said.